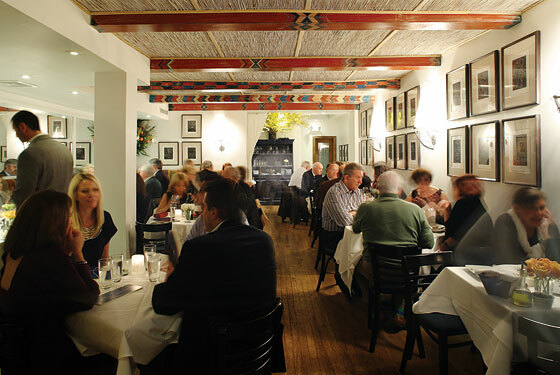 The proprietors of Persephone are Steve Tzolis and Nicola Kotsoni, who run Il Cantinori, in the Village, and also Periyali, in the Flatiron district, which, once upon a time, served as the city’s model for elegantly traditional Greek cuisine. These are small, dependable establishments, with settled menus and an even more settled clientele, and Persephone has been conceived in their mold. The room’s rafters are painted in colorful stripes to resemble, the waiter politely informed my mother, a seaside taverna in Greece. The appetizers include faithful renditions of the usual taverna favorites, like curls of soft char-grilled octopus, chunks of fresh tomatoes tossed with feta and onions, and squares of salty fried halloumi sheep’s-milk cheese imported from Cyprus. The worst of these little dishes was a plate of gum-thick cod fritters; the best was the octopus, which goes nicely with the tomato salad and a helping or two of sweet, puréed fava beans poured with olive oil and served with toasty triangles of pita. This is pretty tame stuff in this era of increasingly pyrotechnic nouveau-Mediterranean cooking. But what the non-Mediterranean chef, James Henderson, lacks in originality he makes up for in the quality of his ingredients (the boutique origins of which are mercifully excluded from the menu), and in his execution. If you have to choose, go for the heavier, more rustic dishes over the lighter, more subtle ones. There is nice peasant-style rabbit stew simmered with what appear to be a thousand pearl onions, and a dense helping of moussaka served in a quaint porcelain ramekin and flavored with plenty of nutmeg and cinnamon. The grilled dishes are also uniformly excellent, particularly the bone-in veal chop over a mound of pleasingly oily crushed potatoes, the earthy, crunchy-skinned rack of lamb, and the quail, which is set over a tangle of sautéed escarole and dandelion greens and scattered with crumblings of fresh feta. Some of the seafood items, like the watery shellfish orzo, are bulky by comparison, although my mother made polite noises about her salmon fillet, which was buried in a drift of very un-Greek black-eyed peas. In fact, my mother made polite noises about most things she encountered at Persephone. She liked the smell of roses in the clean little room, and the cosseted sense of clubbiness that used to be the hallmark of the best restaurants in town. She liked the glass of Muscat presented to us after dessert, and she even liked the desserts, which by today’s baroque standards are simplicity itself. The flan tastes of cream and burnt sugar, the way flan is supposed to taste, and the smooth Greek yogurt is served unadorned on the plate. It comes with “spoon fruits” of candied orange peel, cherries, and candied grapes on the side. Ask politely, like my mother did, and they’ll even drizzle it with honey nectar flown in specially from Crete. At Elettaria, furtively located behind a red painted door among the jumble of knickknack shops and seedy shoe stores east of Sixth Avenue on 8th Street, you will find many of the more trendy, au courant, big-city restaurant styles in place. The name, I was told by one of the food savants at my table, refers to an esoteric type of cardamom. The resident mixologists at the bar are veterans of the trendy downtown restaurant Freemans and the trendy downtown cocktail lounge Death & Co., and the chef is Akhtar Nawab, who cut his teeth at that seminal haute-barnyard establishment Craft. The softly glowing lounge-style space (which used to house a club where Jimi Hendrix, among many others, performed) contains a big bar up front (where you can addle yourself with archly named creations like “Kentucky Firing Squad” and the absinthe-flavored “Zombie Punch”), the obligatory wood (hickory, in this case) dining tables, and, way in the back, a bustling open kitchen. The name makes Elettaria sound like a restaurant of the most ambitious, high-minded kind. But the small, truncated menu makes it feel more like a high-minded bar, albeit one serving studied interpretations of expertly pan-roasted sweetbreads (scattered with pink peppercorns), deep-fried quail (sprinkled with pomegranate seeds in a light beer batter), and tasty crépinettes of pig’s trotter prepared in the classic French style. Nawab has run several kitchens around town, but this is probably his most refined cooking to date. The menu contains many South Asian references, some of which feel strained (soggy spinach covered with soggy ricotta balls instead of the usual paneer cheese), and some of which don’t. The best is the duck breast, plated over a cinnamon-and-cardamom-infused interpretation of the ground-meat dish keema, made here with minced duck leg. The slight desserts—fried doughnuts with rosewater, a gummy chocolate financier—make almost no impression. So avoid them, and do what the food savants do. Order another drink. Hours: Dinner: 5:30 to 11 p.m. daily. Lunch: Monday through Friday noon to 3 p.m. Brunch: Saturday and Sunday noon to 3 p.m.
Prices: Appetizers, $10 to $16; entrées, $22 to $29. Note: The all-Greek wines stack up nicely against some of the rarefied lists in the neighborhood, and they’re comparatively cheap. Scratchpad: One star for the civilized space, and another for the civilized, unpretentious cooking. Hours: Dinner: 5:30 to 11:30 p.m. daily. Prices: Appetizers, $9 to $14; entrées, $18 to $25. Ideal Meal: Fried quail or sweetbreads, duck, cocktails. Note: The Zombie (three kinds of rum, absinthe, Falernum, and mint for $14) is so potent that the bar permits only one per customer per night. Scratchpad: This is multi-star cooking, such as it is. All the chef needs is a bigger stage.